Dear friends and donors, Charity organization Serbs for Serbs have finally registered in the state of Illinois in United States by the group of the Serbian youth. Charity organization Serbs for Serbs is currently in the process of applying for a 501(c)3 non-profit organization status. We registered organization in Jun 2010 and we have already started working and began raising donations. Since this is our fresh start in the United States please excuse us for any difficulties and mistakes that we make in the beginning. 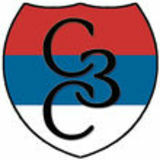 About Us The mission of Charity organization Serbs for Serbs is to affect on consciousness of Americans, Serbs and their friends through planned projects, social and humanitarian activities in order to develop and foster better society for future generations and provide aid for underprivileged families in need. Although there are many humanitarian organizations and associations, help often doesn't reach the most jeopardized. Due to unnecessary administration, missing information and slow decision making, the delivery of aid arrives too late to the final consumers, or not at all. It is a sad and embarrassing, but true fact that more than 18.000 children daily die around the world because of starvation and malnutrition. There, among us, the blind and deaf. We are witnesses of the bad demographic situation of our nation, decreasing natality, increasing number of singles, abortions, accelerated aging of the population and generally bad economic condition of the households in Serbia, Republic of Srpska and Montenegro and other countries in the Balkan. The mission of Charity organization Serbs for Serbs is to affect on consciousness of Serbian people through our projects and humanitarian activities, in order to develop better society for future generations. Why Serbs for Serbs? We wanted to alleviate impaired spirit of Serbian people in togetherness and brotherhood help through humanitarian work and social aid. Who do we help? We help Serbian families who live in the Balkans, have five or more children and live in terrible poverty. Who do we need in organization? We need members and donors that will secure financial stability through supporting our programs and activities in the future. Donors may join our daily activities within the organization in order to coordinate our work better. We also need volunteers ready to donate several hours per week for actual work within the organization. Activities of volunteers and their specific tasks would be determined by the required projects and their personal interest. From that group of volunteers we would look for future leaders of organization. How do we define “terrible poverty”? Under terrible poverty we define absence of one or more basic factors required for living: food, clothes, shoes, and safe space for living. Why do we help? We believe that there is a basic need for one human (or a group) to help others in distress. A help is not only human virtue but also a Christian responsibility. By focusing our help on families with many children, we directly affect on their stirring toward becoming independent from social-dependable government programs. Indirectly, we want to affect on birth rate of Serbian people that has been in great decline in last 20 years. Charity organization SZS together with student fund "Osmeh na dar" and friends from Belgrade and Kosovska Mitrovica gathered a small donation to help little Darija Antovic. She lives with her parents in Zvecan-Kosovo and Metohija. Two year old Darija has cerebral palsy and she is currently in the process of recovering from it. The help from SZS organization consisted of gym mat, Pilate's ball, rocking horse, eye band aids, different toys and candy in the value of 4,800 dinars. Our organization friends from Kosovska Mitrovica, have delivered this help few days ago. They also paid a visit to little Darija and talked with her parents. Her family is forever grateful for all of the help they have received and to the people of great will and open hearts. God willing, We are hoping that little Darija will soon fully recover. Marina Jovanovic from Leposavic, received a gift Laptop computer delivered by Organization "Mother of Nine Jugovich" and donated by Organization "Serbs for Serbs". Visitors of website for soup kitchen's remember the story of Marina Jovanovic, senior student at Medical High school in Kosovska Mitrovica. besides the horrible conditions that she lives in and all of the horrors in her life, she has somehow managed to be elected as the Honor Roll student 3 times at her High school. The problems for her family still persist, but she never looses hope, she tries as hard as she can to be the best student. She says that the story about her life on the website of Organization "Mother of Nine Jugovich" resulted in a certain number of people offering help for her, but the actual help did not arrive yet. Representatives of humanitarian organizations Serbs for Serbs from Switzerland Dusan Ä?akoviÄ&#x2021; and the Republic of Srpska Dobrina Kusmuk and Vaslija Obrenovic met the mayor of Lopare Dr. Rade Savic with the activities of humanitarian organizations and how to help families in Majevica. The potential of the Serbs in the diaspora is huge, and with small but regular individual donations and allowing the families to work and earn income would be able to quickly solve the vital problems of those who do not have sufficient means to live. The Laptop computer gift she received from Organization "Serbs for Serbs" has brought nothing but joy to her. Computer will be extremely helpful for future education if she has enough means and funds to continue. Marina also wanted to express gratitude and thanks to all of the people involved in providing necessary help she needs, wishing them joy, health and happiness so that they can continue their work and efforts in helping all of the Serbian people in KiM. We would like to remind everyone interested in helping the Jovanovic family, you can contact them directly 064235-1733. Also, you can send a donation to account, name: Srdjan Jovanovic 1160626602000105 PRO CREDIT BANK OF KOSOVO. Monthly Report Christmas, representatives of Serbs for Serbs Charity Organization from Switzerland Dusan Djakovic and the Republic of Srpska Dobrina Kusmuk conducted three major actions in Srpska. They tried to make holidays more beautiful for at least one of many families living on the edge of poverty. we agreed to purchase food that they need to make their winter at least little shorter until our next arrival. Just like the previous time mother Mira is worried about the food for little Svetlana, who cannot process the regular milk yet and is needing formula which is really expensive. Father Drasko informs us that he managed to secure some material from the company he used to work for who owned him money. In an addition we discussed how we can help them permanently. Short after that we went to shopping center in Prijedor in order to bring the action to the end. At the shopping center we bought various supplies for hygiene, food and of course we cannot forget the candy for the children. Total value was around 400KM. We returned to Marijanovic‘s home to leave the merchandise we purchased and with good buys we deported for Bosanski Samac, where we slept overnight ahead of the second day of our action in the Republic of Srpska. Guinness‖. The land around the Neretva is very fertile, and Miladin knows how to use that. Our impression about them was very positive. They aren‘t giving up due to the difficulties in life. Miladin and his son Bojan are growing the land given to them in lease, mostly from the neighbors living in Diaspora. Up to now they managed to do that only when they were able to rent a tractor, which made them dependent on someone else‘s plans and free time. The land in their property is far away from them, so the tractor we gave them will now enable them to grow their land as well. The reaction of everyone present assured us that we did the right thing by delivering the tractor. That was confirmed when we all saw Miladin‘s determination to use this donation the best way possible. The tractor will surely help this family to become completely independent and financially stabile family in short notice. We should mention that this action has not yet come to its end. We need more money to buy the appliances for the tractor, so that Miladin could upgrade the production. We hope to get the appliances soon, which will end this important project. However, we have seen that all things said about Miladin and his diligence was true, because he is not waiting for our organization to buy everything, but he‘s borrowing from others, thus not wasting the precious time for farming the land. This project of the organization was not only the largest financially, but also the most important. The buying of the tractor represented the fulfillment of our primary goal concerning all the families – to allow them to stand on their feet through work and production, a long-term perspective and financial independence. We got a promise from Miladin that he will use the tractor to help other Serbs from Prebilovci and nearby as well. We left the Ekmečić family with the desire to meet them again soon. On our way back we stopped to see place where there were once the monument dedicated to the murdered Serbs in the World War II and the Orthodox Church, both destroyed at the beginning of the war 1991 by the descendants of those who killed the Serbs earlier. Despite the attempts to hide the evidence of the suffering of Serbs, a new church and the monument will be built again. After visiting the Republic of Srpska, the representative of the charity organization Serbs for Serbs from Swizerland visited the ten-member family Matić in Novi Sad. The members of the family are the single mother Jadranka and her children Milena (26), Milorad (24), Đorđe (22), Milica (17), Miloš (16), Dragana (14), Snežana (14), Predrag (14) and Verica (11). The family has an income of 8.400 dinars (just over 80 EUR) which Jadranka earns as an employee of Clinical center in Priština. On the second day of the visit in Republic of Srpska representative of charity organization Serbs for Serbs, Dusan Djakovic and Dobrina Kusmuk visited Lopare. In Lopare our host was Mr. Vaslija Obrenovic, a man with a big heart and a great patriot, even though we spent couple hours with Vaslijem it was enough for him to become one of us and be a part of what we do. On that occasion, and before the planned visit to the family, we met with the mayer of Lopare Dr. Rado Savic. those families as well as his desire to facilitate our visit to the families that we choose to help in this action. Thanks to the hospitality and kindness of our hosts, although we were in Lopare for the first time we felt like we were among friends of many years. We quickly found the village Peljav and family Cetkovic. Milorad got married ten years ago with Genoveva, Romanian woman, with whom he had four children Gina (9), Miodrag (8 ), Milijana (7), Mirko (1.5) years. They live in an unfinished house that has only two rooms. Milorad wages and thus trying to feed his family. Genoveva, very valuable and a good mother she ties to contribute as much as possible. Children are beautiful, loving and raised well, they are good students as well. During our visit Mirko was sleeping so tight that even our voices didnâ&#x20AC;&#x2DC;t wake him up, while other children curiously accompanied our tour. We found out that Genoveva stay was not legalized in our country and in the meantime, her passport has expired and we promised to help her collect the necessary documentations. In further conversation with them we tried to figure out what is the most effective way to help Milorad,Genoveva and their children so we concluded to buy them a cows, for which they have good conditions and enough land. In this way they donâ&#x20AC;&#x2DC;t have to buy milk for the children and could sell rest and have a monthly income. Monthly Report sufficient funds to complete a modest home so that kids can move before the house they live in collapse. Because Todorovic family received assistance for New Year from Majevicani we tried to figure out what could be the best possible way to at least little bit improve children‘s dull life. Radislav told us that they carry water every day a half kumometers distance. During Vasilije‘s last visit he told us that he sow lice in the girl‘s hairs so we agreed to help with other brotherly organizations and municipality so that we can at least provide water a front of the house for the children. Our plan was to visit household of thirteen members, family Todorovic in the village Labucka but we were told that this village was far and it could not be approached by a car. Since Vasilije helped them for the New Year with some urgent needs of this family, we agreed that he will visit them later to see if we can help the family with something in long term. ‗Mother of Nine Jugovica‘ from Zvecana, have once again successfully garnered much-needed support for the most vulnerable Serbs. A total of eleven families from the Novo Boro and Strpce townships have been assisted as well as the soup kitchen in Prekovac. Contributions totaled approximately 5,100 Euros ($6,939 USD). schoolyard is full of smiles, the clamor of children and happiness at our arrival. It is difficult to explain how our visit alone is cause for great joy to the children and people of the Kosovo-Metohija enclaves. Quite simply, it is difficult to understand unless one experiences it directly. In the schoolâ&#x20AC;&#x2DC;s facilities, lined with all twentyfour little ones from first to eighth grade, we distribute packages prepared by NVO â&#x20AC;&#x2014;Mother of Nine Jugovicaâ&#x20AC;&#x2DC;. Following our brief interaction with the children and school personnel, we continue our mission with their heartfelt farewells. The next family on our itinerary is the Milic family from Prekovca. This family consists of husband and wife, Vitomir and Leposava and their twelve-year old son, Stefan. Even though they live in poverty they have nevertheless taken in a single mother, Miljana and her two-month old daughter, Anastasia, who have been outcast by her family. The Milic family is managing to survive thanks to meals from a nearby soup kitchen. They have shown great humanity in taking in Miljana and Anastasia as if they were their own. For this noble household we have donated a bed, kitchen sink and refrigerator. Little Stefan received books on Orthodox themes and several toys. The first family we visited was the Zlatanic family from the village of Bostan. The family consists of two sisters and their brother who, are in a difficult mental state and who, through the help of their neighbors and the soup kitchen in Prekovac, manage to survive. We helped this family two years ago with the purchase of a woodburning oven. This time we have purchased a bed and washing machine for them with the hope that it will lessen their strife at least a little. Monthly Report Our journey continues taking us to the village of Zebnice and to the Simjonovic family. The family consists of Dragan, the father and Jelena, the mother of two little girls named Andela (3 yrs.) and Andrijana (9 mos.). This extraordinary family possibly made the strongest impression on us. The young married couple quite simply refuses to succumb to the circumstances life has dealt them. On the road to their cottage, which dates back to the early twentieth century, we encountered hard-working Dragan and his herd of sheep (currently their greatest wealth aside from their daughters). In our conversation with them we learned that they are surviving on modest social assistance. They are hindered by their difficult living conditions in particular because they are not the owners of their dilapidated abode but rather pay a rental fee of 200 Euros a year to Dragan‘s uncle, the owner, for a ―satisfactory‖ dwelling built in the early 1900‘s. Dragan has a great desire to further his work with livestock and wants help in the meantime with the purchase of additional sheep in order to expand his herd. While the Milic family amazed us with their big hearts, the Simjonovic family with their persistence, sadly this family left a bitter taste in our mouths, a lump in our throats and eyes on the verge of tears. The mother and father are in difficult psychological and physical states and their sons even worse. Instead of being full of life and flourishing through various athletic activities, socializing with girls and finding first loves and crushes, empowered by knowledge and planning their own families, with great misfortune they are suffering from post-traumatic stress disorder from the NATO bombings of 1999. They live their pain-filled lives inside four walls. The only ray of light is the youngest son, Aleksandar who, alone cares for the family‘s two cows. The one in deepest despair is Igor, who doesn‘t get out of bed. We aim to ease their profound struggles with the purchase of four beds, a washing machine and four chairs. Through a consultation with the representatives of ‗Mother of Nine Jugovica‘, it was decided that they would assist with that aspect of aiding the family and we would provide a washing machine, bed, sink and for the youngest ones packages of toys and sweets. With words of support and encouragement, we bid farewell to this hard-working family and continue to the village of Straza. In Straza we visited the Stojanovic family; father, Gradislav and mother, Biserka and their four sons, Milos (21 yrs. ), Igor (20 yrs. ), Stefan (18 yrs.) and Aleksandar (12 yrs.). psychological and physical states than the Stojanovic family. In addition to books and toys for the girls, we obtained a washing machine and three beds for the family. With this visit, we complete our tour of families in the township of Novo Brdo. On our return to Zvecan we stopped by Monastery Draganac, an endowment of holy martyr Tsar Lazar, erected in the 14th century and named after one of his daughters. The church was destroyed several times and rebuilt ten years ago, thanks to the arrival of Father Kiril, an extraordinary individual who with his God-given hands singularly rebuilt a large portion of the monastic complexâ&#x20AC;&#x201D;the strength of this man is truly unbelievable until it is witnessed firsthand on site. Father Kiril hosted our small group and upon brief heartfelt conversations we warmly part ways with an invitation from him to return to the monastery when each of us marries. An interesting aspect of our recent humanitarian mission is the fact that, due to the financial contributions we received and the number of families we subsequently planned to visit, for the first time ever we were able to devote two full days to the aide effort. We begin day two of our mission in the early hours of Sunday, January 16, 2011 heading to the township of Strpce where we will help needy Serbs living in that area. In Strpce we were greeted by Father Aleksandar, our old friend from earlier missions in the area. With his enormous help we discovered and visited six families from within the neighborhood. Monthly Report and the harsh reality of the first five families from that village. The Stankovic family, consisting of Stanko, the father and Ivana, the mother and their two girls Aleksandra (2 yrs.) and Andrijana (4 yrs.) live in catastrophic conditions without a bathroom in a one and a half room dwelling, on social assistance and sporadic minimum wage. We did not find the father at home and from Ivana, his wife, learned about their most pressing needs. Due to their dire living conditions and their small children we have decided to designate for them a refrigerator, washing machine, bed, four chairs and a vacuum cleaner. The children will receive clothing, toys and sweets. Monthly Report sweets, toys and books to children who had gathered because of our visit but whose families we did not help during this particular mission. Report: Bojan Ilic ,Serbia (Photos ,Serbian Report) On Sunday, 23 January, three activists of the Humanitarian Organization "Serbs for Serbs" have visited two families from northern Serbia. We have delivered aid worth about 1,200 euros and this time pleased 22 people, including a 16 children. Assistance for family Ljiljak the Banat villages Neuzina was in the form of purchases cows in the value of 900 euros, and assistance to family Milutinovic from Backo village Pivnice consisted of basic food items to 300 euros. Support our organization. СВИМ ДОНАТОРИМА И ПРИЈАТЕЉИМА ОРГАНИЗАЦИЈЕ СРЕЋНА НОВА ГОДИНА! Charity Organization Serbs for Serbs from USA wish you a Happy Orthodox (Serbian) New Year! 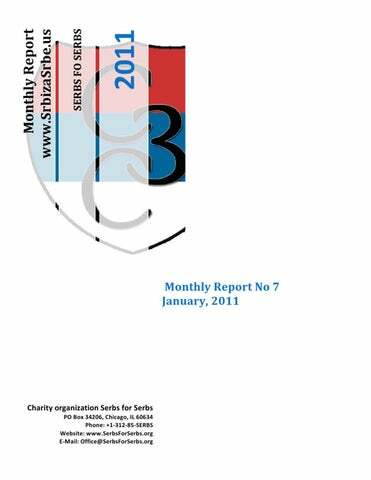 Monthly Report Charity organization Serbs for Serbs is currently in the process of applying for a 501(c)3 tax-deductible organization IRS status. Хуманитарна Организација Срби за Србе је регистрована као непрофитабилна организација у држави Илиноис и тренутно смо у процесу за добијање статуса 501c3 који би омогућио свим донаторима да донације упућене нама могу да се отпишу од пореза. У наредних пар месеци очекујемо позитиван одговор од IRS-а.